a. A leisurely walk, especially one taken in a public place as a social activity. b. A public place for such walking. Snohomish’s 1910 Carnegie building with its attached 1968 addition was closed this month because the addition’s flat roof is water logged and unsafe. (“Snohomish group hopes to restore historic Carnegie building”) Mother nature intervened in the nick of time as the collective imagination around our historic property was moving in reverse. 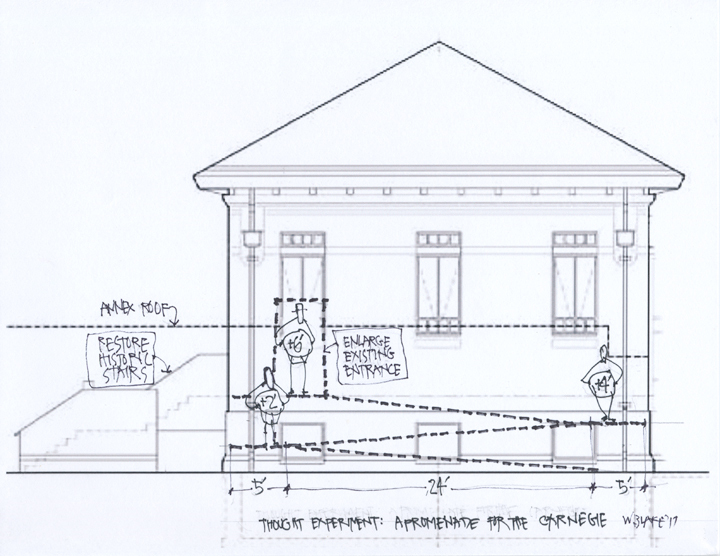 In 2005, I served on the seven-member Carnegie Preservation Commission with the mission to oversee a feasibility study of returning our historic library building to its 1910 stand-alone stateliness. While many of the commission members went on to form the Snohomish Education Center at the Carnegie, I went on to write an Op-Ed. 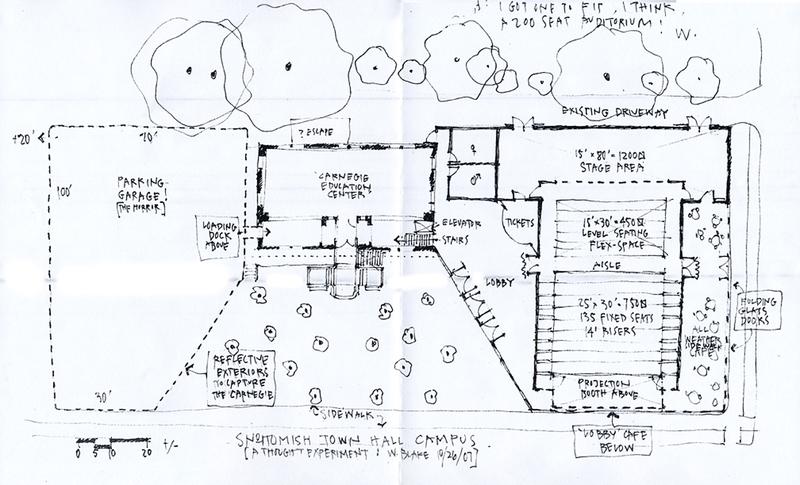 “A gathering place for Snohomish,” published in the Snohomish County Tribune, October 25, 2006, was a plea to consider the practicality of the addition that increased the functionality of the small historic library (its restrooms are in the basement and no interior stairs) with the common sense solution of a lobby between the old and the new structures that included restrooms! Over ten years later and still without funding to demolish the addition and restore the former library, city hall talk turned to modifying the lobby in order to use the main floor of the Carnegie for council meetings. The talk included the necessity of installing a chairlift-for-stairs in order to meet the requirements of Americans with Disabilities Act (ADA) to the rumored tune of $70,000. No cost mentioned for adding a second egress or fire escape. Then, Mother Nature stepped in and put the brakes on this backward thinking. Since doing my thought experiment sketch some 10 years ago, fitting a 200 seat theater into the footprint of the addition, I’m wondering if ramps might solve the sticky social issue of dividing the abled from the disabled access from the ground to the grand room of the historic structure. Confirming my calculations with two architects, I prepared the sketch pictured above. It calls for the removal of the addition, completely, especially across the front of the historic structure. Then, installing three runs of ramps with landings and modify the existing penetration of the south wall with exterior doors and portico over the top landing. 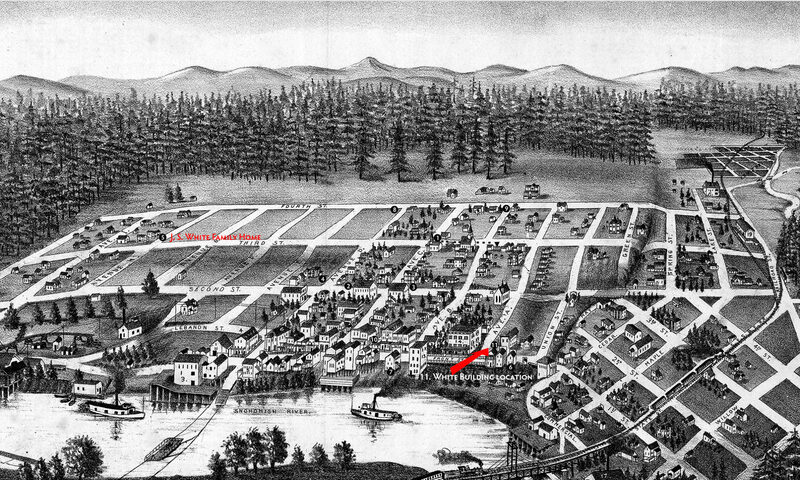 It might be called the Snohomish Education Center Promenade — children would love it. At the same time, the historic stairs to the front door would be restored providing a second egress. To close with a thought from 2006: the gift of a Carnegie Library is not from the man whose name it carries, but from those who lived here before us and pursued a dream. Members of the Women’s Club who went door to door gathering donations for the new library. Members of the city council who four times a year had to pony up the contractual $250 for library operations from a tight budget. This is why we collectively treasure the small, problematic structure – for the stretch, the previous residents reached to celebrate life in Snohomish. How far are we willing to reach? Thanks to Dale Preboski for editorial advice. Next PostNext Video: A Shooting Gallery?